An afternoon of downtime in Washington DC a few weeks back afforded me an opportunity to visit Arlington Cemetery, and the grave of my great grandfather, Major Thomas Tidball Trapnell. It was a chance to get a few moments of peace in an otherwise hectic week, and to forge a connection with a man I never knew, and who was rarely spoken of in my family. 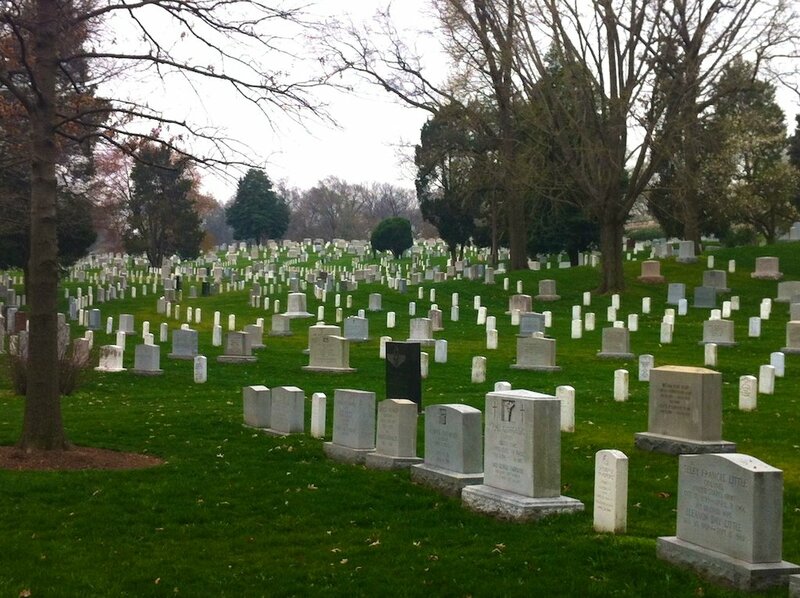 When I last visited Arlington in 2000, on a side trip during a wonderful vacation with my daughter, Zoë, I had no idea I had a relative buried there, much less someone as close as my great-grandfather. 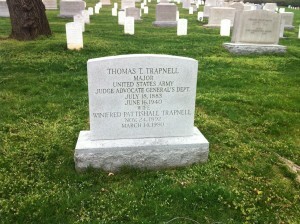 That’s probably because since 1940, when Thomas Trapnell died at age 56, his grave had only been visited once or twice by any of his descendants, and certainly none within the past half-century. It seems great grandfather wasn’t terribly popular among his offspring. Thomas Tidball Trapnell was the 10th of 11 children born to Joseph Trapnell III and Rebecca Holmes White. He attended Annapolis, joined the Navy (which his father managed to reverse through an action by Theodore Roosevelt), and later attended NYU, where he earned a law degree (following in the footsteps of both his father and brothers). Tom initially practiced corporate law, but following the outbreak of World War I, joined the military, where he remained the rest of his life. An attorney in the Judge Advocate General’s Corp, Tom was somewhat unremarkable amongst his accomplished brothers, and unique among his sibling in divorcing his spouse, my great grandmother Edna Valentine. His letters to her while still married are typically aloof, written in an irritated voice, and often complaining about either her, money, or both. 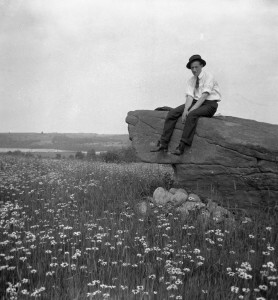 Their divorce was a family affair, with Tom’s brother, Ben, providing counsel to Edna, and everyone apparently trying to make the best of it during a time when getting a divorce was challenging, even in New York state, where Edna resided. Following the divorce, Tom and his son, Coles, didn’t get along so well, and letters from father to son are mainly directive, with little affection or indication he had much insight into my grandfather’s nature. My grandfather grew to be rebellious towards his father, and the two had a volcanic fallout shortly before Tom’s death in 1940. Family baggage aside, finding Thomas Tidball Trapnell’s grave was important for me. For someone so close in my family tree, I know very little about him, and though he had been dead for twenty years when I was born, his strained relationship with my grandfather had kept him off the radar screen. Learning more about his history has recently become a higher priority research task for me. The visit to Arlington and Tom’s grave couldn’t have been more poignant. It was a cool March day, with a light rain falling on the cherry blossoms that were just beginning to bloom. As I walked past rows and rows of graves, off in the distance a full military burial was underway, complete with horse-drawn carriage and 3-volley salute. With good directions from the staff at the office, I was able to locate the grave of Tom and Winn (his second wife) without too much wandering, and snapped a couple of photos. It was a small, quiet family reunion, but after more than 50 years without a visitor, at least one of us enjoyed it very much.